After taking breakfast, I ventured out to buy some soap to wash the breakfast utensils. For this noble task, I was dressed in a blue pair of jeans, Barcamp 2010 t-shirt and brown slippers from Bata. That may be an irrelevant detail, but as I was on my way back from the shops, I bumped into my local "jack-of-all-trades". the "jack-of-all-trades" is the guy who arranges for all household deals in the neighbourhood, from hiring of houses, leasing of the same, electrical and plumbering repairs and many more. We shall call him "Joat" for the simple reason that I am getting tired of typing his full title. So Joat told me that he had some house he thought I was interested in. I got back to the house, but before washing the utensils, I decided that I should call Joat back so that I could take a look at the property. So I called Joat back and he told me he was at the place where they sell "Chips" or what they call french fries in the Queen's English. So I went to the place where chips were sold in the open, but I couldn't trace Joat. I then figured he must have meant some fast food shop about 200m away. So I wen to the shop, but still there wasn't any sign of Joat. Just as I was turning to call him on my phone, Joat called my name from some nearby bar , or what the Queen would refer to as a pub. I went into the pub, and Joat told me he had decided to buy a soda there since the fast food shop was full with clients, or hungry fast-fooders. So I stood at the entrance as Joat directed me to the house, and as soon as he was through, I turned to leave. At this point, Joat hadn't been served as he had Just come in. As I left, I met with an Administration Policeman, in his official attire, who pushed me back into the pub. You don't require a lot of intelligence at this point to know that you are screwed up. Other adjectives that describe this situation are been buried to your neck in some form of excreta or some four letter word that I shall desist for now from writing here. My English teacher, one Mr. Waweru (whose only memory is hearing running footsteps on the veranda outside our primary school class and then seeing a pre-teenager running with Mr. Waweru in hot pursuit, a whip in his hand) would have preferred "been in hot soup" as fitting enough. An administration policeman, is a form of police force that exists in Kenya and are closes to the country's ruling class, politically. Other tasks for the APs are to conflict with the regular police arm, the same way the FBI and the CIA have been known to act in contradiction. Back to the infamous pub, which I don't remember having a name, I was instructed by the longest arm of the law to take a seat. More APs followed, several armed with aging aged G3 rifles and in uniform, a few plain clothes and some fellow I was made to understand was our local chief. They then ordered the 2 bar operators out of the pub, with 3 crate-full of beer. At the same time, the chief ordered that I and Joat be handcuffed, and we were ordered out into a waiting white government Landrover Defender 110. We were bounded into the Landrover, as were made to understand that it was illegal to be drunk on Sunday in a pub, at noon. Mind you we were all stone sober. Into the Landrover, where we joined some woman bundled in with a few cartons of distilled spirits, and some man in "Total" overalls who was bundled with an assortment of welding and metal cutting paraphernalia. One of the bar attendants was ordered by one of the APs to go take some coat and put it a nearby shop for safe keeping, and before he came back, the APs climbed in and ordered me to stand and squeezed us in to create space for them. The Landrover then sped off to the nearby chief's camp at Mukuru, where we were all ordered out and told to cool off by a bench outside the Chief's office. Some people sooned streamed into the Chief's camp, who I was made to understand had come to "see off"(sindikisha [swahili]) the woman arrested with spirits. The APs then discussed our predicament for a moment , before they came back and explained that the pub we were arrested in had been reported by the neighbour residing behind the pub to the DC and to the National Environmental Authority (NEMA) for operating in a residential area and for noise making. Both the distilled spirits operator and the pub operator had been arrested on orders from the District Commissioner(DC) from Embakasi. At the same time, some muslim guy drove in , who was reffered to as "sheikh". Sheikh had come to see off the metal welder, whose breach of the law was operating a shipping container (been converted into a shop) in an area not allowed. The distilled spirits operator, and the pub operator were to be transported further to the DC's office in Embakasi since the orders had come from there. Joat and I were told that we should "see ourselves off" at a cost of Kshs. 2000 per head or we would also join the pub owner to Embakasi where the standard rates for "seeing oneself off" was Kshs. 3000 per head. Our breach of the law , we were made to understand, bordered drinking in a pub at disallowed hours , but was later changed to "sale of liqour without a license". The pub operator was informed that his counterpart had been left since if they arrested both, they would be no one to come to see them off. We said we didn't have that much money , where the APs then told us to fork out all the money we had. Joat forked out Kshs. 200 and I forked out Kshs. 900. They took the money which they handed the APs accompanying the rest of the suspects to the DCs office. 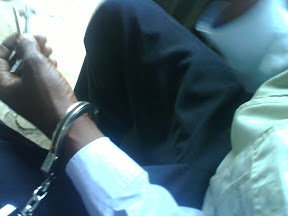 We were then told to wait on the bench, where we had our handcuffs removed. We were told to fork out the balance or better yet face the charges or spend the night in a cell. Joat and I called some friends to come see us off. We were then bundled into the office with the welder. Sheikh saw the welder off and left. The welder was told to leave his paraphernalia at the police post and return for it the following morning. The names (sans ID numbers) of all suspects arrested and the offences were then entered into a dog-eared , coverless Occurrence Book which also had some of its pages at the front torn out. The office featured a 1 page calendar from some Missionary church at the back and a noticeboard with 2 notices; 1 detailing the various ranks of the AP and another detailing the mission and motto of the AP, all worn out to some degree requiring considerable effort to read them. Joat and I were then told that we see ourselves off at a reduced cost of Kshs. 1000 per head since the 1,100 we had paid so far had gone to the DCs APs while the Chief's AP's needed their share too. We emptied our pockets to show that we had no extra money.Joat alse explained that he had Mpesa(d) the money he had in the morning to see off a friend who had been arrested at some other police station. The people we had called to see us off had reported and left as mere spectators. At the point, one of the APs was able to suddenly recall that he knew Joat and they met during (APs Night) patrols, and we could be released on condition that Joat would soon pay off the balance. At a few minutes past 2.00 p.m, Joat and I left the police post, I still in slippers, ending my first daylight robbery ordeal, from the same people am encouraged to report too once I get robbed. Oh, and by the way, when the APs learned about my profession, they jokingly told me not to write about them. I hope they were joking, cause I just did. Pole Sana bro. I wonder when the kenyan police force will earn respect and trust from kenyans. These are some of things that would make me vote in the defective proposed constitution! i told them we have a taxi, i just need to pay 5 soc for the transport - and they said the OCS said they must use their car. so even when ur on the right,, you are exploited !